“It’s time for you to take self-care into your hands and Love Your Mind,” urges CreComm student, Jennifer Pazdor. 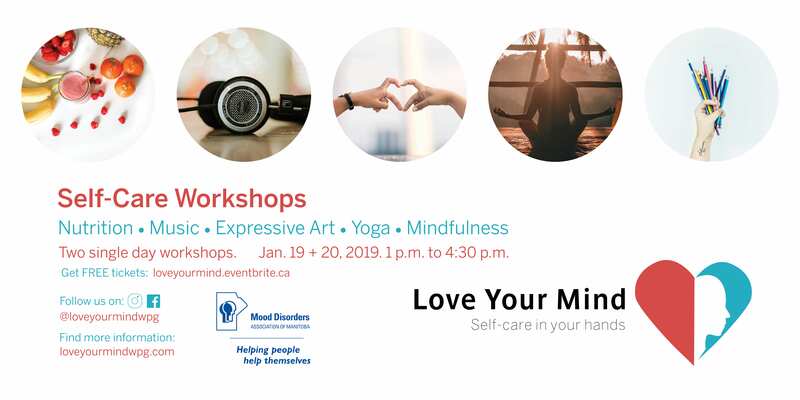 She, in partnership with Mood Disorders Association of Manitoba, is hosting two individual days of self-care for youth and young adults in Winnipeg. Each topic will be taught by a skilled instructor who will explain how the technique can impact your wellbeing and help you learn to use the technique in your life. Workshops are free to attend so choose the day or location that’s best for you and reserve your ticket on Eventbrite. January 20 workshop: Temple 23 Winnipeg (Exchange District, 62 Albert St.). Food and beverage will be available. There will be door prizes and giveaways. Each attendee will receive a self-care package at the end of the workshop with some gifts and guides to self-care. Donations to Mood Disorders Association of Manitoba are welcome. Follow Love Your Mind on social media for more information: @loveyourmindwpg and check out their website: loveyourmindwpg.com.